Made from hardwood, in either mahogany or lacquered oak finish with baized base and rounded moulding. Hover over image to see alternate colour. 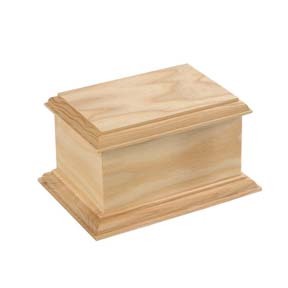 A superb quality casket in natural oak for the larger dog only. Antique finished “Tack Room” style casket for larger dogs, featuring leather and brass style straps and fastenings. Inside, mementos can be stored on a removable shelf hiding the remains. 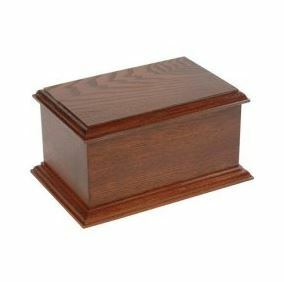 For storing ashes or other keepsakes such as collars or small toys. A willow casket containing a linen liner bag with drawstring. Biodegradable for burying ashes. Bronze or pewter finish. Made in the UK. Suitable for indoor or outdoor use. Maintainence free. A beautiful cast resin casket, electroplated in copper featuring a dog with bone. Suitable for all but the very largest dog. “At Peace” cat casket in black finish. Hand-made in the UK. Suitable for indoor or outdoor use. “At Peace” cat casket in bronze finish. Hand-made in the UK. Suitable for indoor or outdoor use.